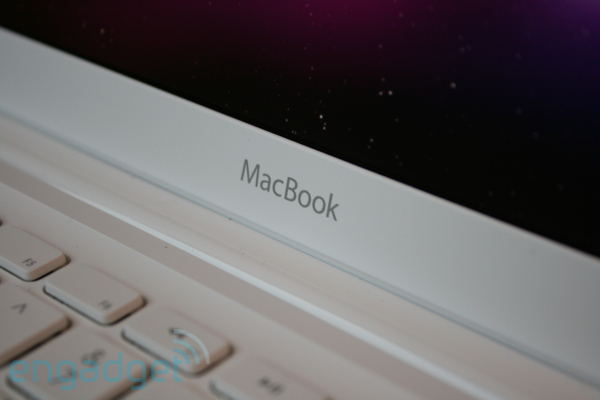 We'll just come out and say it: we're totally underwhelmed by the new plastic MacBook. Hell, we were underwhelmed by the old plastic MacBook back in June, when we reviewed the refreshed unibody MacBook Pros -- we said we were "honestly left wondering" why the $999 plastic model continued to exist when the $1,199 13-inch Pro was obviously superior. So when we heard the first whispers that Apple was working on a total overhaul of its low-end MacBook, we naturally assumed that it would either gain in features or drop in price -- but neither one of those things happened. The new plastic MacBook remains priced at $999 in its only configuration, and while it's been updated with the same unibody construction as the Pros, it's also lost some features along the way. So... what's going on here? Did Apple just blow a huge opportunity to totally re-think its low-end formula, or is there more to the MacBook than the spec sheets and price tags say? Read on to find out. Although it's easy to miss at first glance, the new MacBook is externally quite different than its predecessor -- it's all curves instead of hard angles. 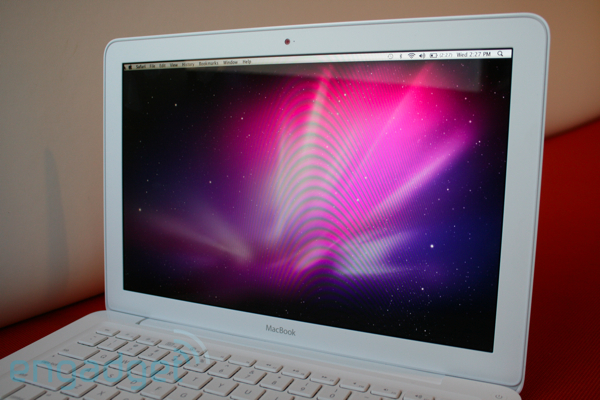 Considering their shared unibody roots, it should be no surprise that there's a strong family resemblance to the aluminum Pros -- apart from some more aggressively rounded corners, the MacBook is essentially the same case rendered in gloss white plastic. That translates to an incredibly solid feel, with zero chassis flex and no squeaks or rattles whatsoever. Here's the thing about that gloss plastic, though: while it's not the fingerprint magnet we expected it to be, it scratches like crazy. Seriously -- all we've really done with our review unit is take it out of the box, snap some photos, and move it around the office for a day, and the top looks like it's been attacked by a bear. Considering how durable our older (black) plastic MacBooks have been, that's pretty disappointing -- we're guessing the case-protector market for this machine will do brisk business. On the flipside, it's certainly easier to clean the glossy palmrests, so we're hoping they won't discolor as easily as on the outgoing model. Sadly, that doesn't carry over to the bottom panel, finished in a soft-touch rubberized material which picks up all sorts of grime. Again, this machine has only been out of the box for a day, during which time we've taken its picture and used it on a desk to write this review, and all four contact points on the bottom have become worn and discolored. (That little yellow patch wasn't there when we unboxed it, remember?) To be fair, the dirt there cleaned off pretty easily -- Apple recommends a microfiber cloth, of course -- but the color didn't change back, and we imagine it would've been even worse if we'd actually taken it out of the office. Once you open it up, the standout new feature is the large buttonless glass multitouch trackpad, the same unit found on the Pros. If you've been following Apple, you already know all about this guy -- the immense glass surface is a pleasure to track on, but the one-big-button design is definitely polarizing, and it's up to you to decide if you love it or not. On the other hand, we'll just come right out and say we're in love with the keyboard, which is about as solid as a chunk of granite -- we pounded away pretty hard writing this review, and there was absolutely zero flex anywhere. Chalk up a big win for unibody construction. As far as the screen, it's much nicer than previous plastic MacBook screens -- it's similar to the panel in the MacBook Air and 13-inch MacBook Pro in that it's LED-backlit and has a nice wide viewing angle, but the Pro has a 60 percent great color gamut. We didn't notice the difference in day-to-day usage, but we did notice that it's rather dim -- to the point where we initially assumed the max brightness setting was only halfway up. It's still a nice screen, don't get us wrong; we just wish it was a little brighter. Round the left side you'll find a surprisingly meager port selection -- two USB, Ethernet, and mini DisplayPort, along with a combo headphone / line-in jack and a security slot. 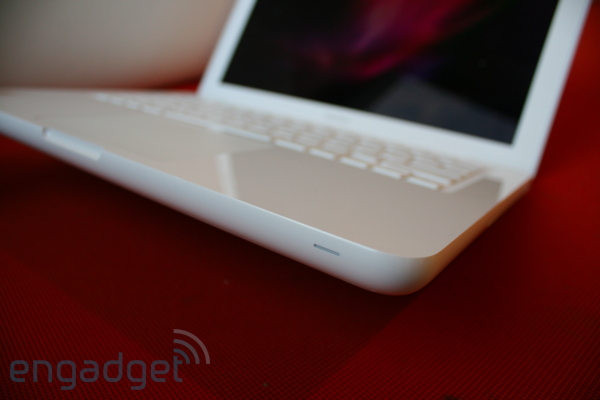 That's it -- no FireWire, no SD card slot, no HDMI. 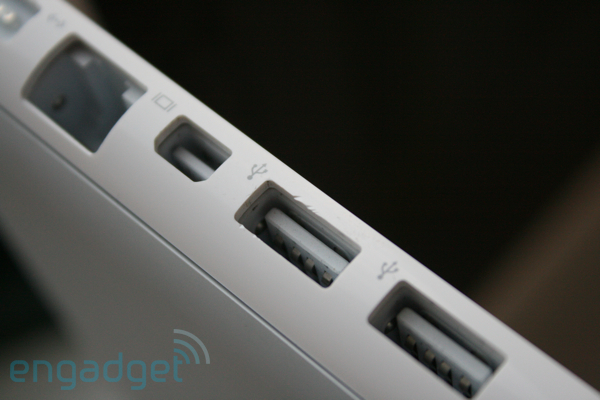 You can make a reasonable case for the lack of FireWire and HDMI (well, maybe), but the omission of an SD card slot is totally mystifying -- there's no way to argue that an SD reader is a feature that should reserved for the MacBook Pro. 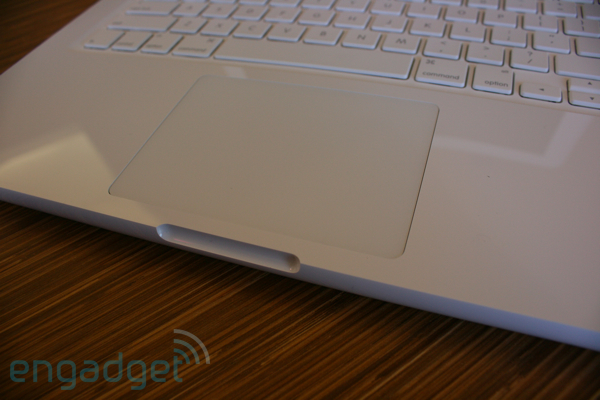 Let's put this another way: we'd gladly trade the fancy new trackpad for an SD slot -- that's how much more useful it would have been. 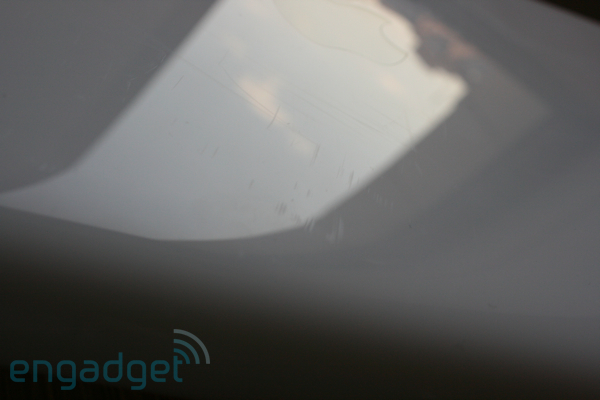 Oh, and that gloss-plastic that scratches so easily up top? Yeah, it's just as wimpy on the sides -- we've maybe plugged one or two things into this USB port and it's already dented up. 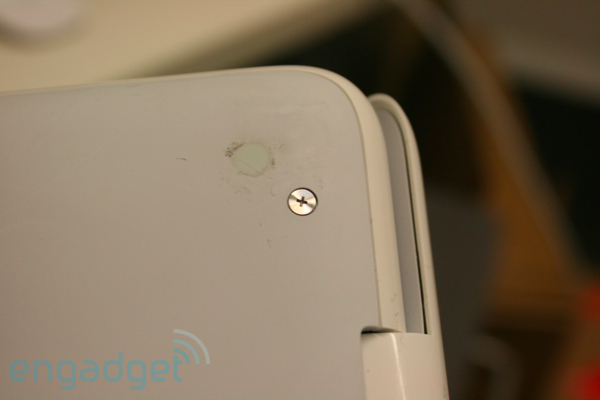 In fact, the more we used the MacBook, the more disheveled it got -- the unibody build might make it stronger internally, but on the outside it's soft white plastic, and it shows right away. On the other side, you'll find a pretty bog-standard dual-layer DVD±RW drive -- no Blu-ray here. None of Apple's machines got Blu-ray this time around, and while we've sort of given up expecting it, it's hard not to notice that lots of other thousand-dollar laptops have BD drives. Inside, the internals have been updated to match the 13-inch MacBook Pro -- a 2.26GHz Core 2 Duo and NVIDIA 9400M graphics on a 1,066MHz bus with 2GB of DDR3 RAM and a 250GB drive. That means it's plenty fast for most tasks -- we didn't run any deep benchmarks, but our general feeling was that performance was right in line with the Pro, and the early numbers we've seen here and there tend to back that up. On the power front, the obvious big change is the new sealed-in battery. Apple rates it at the same seven hours as the one in the 13-inch Pro, and we accordingly got about the same real-world four-to-five hour lifespan out of it during our general-usage sessions -- browsing, image and document editing, media playback. It's hard to quibble with a longer-lasting sealed-in battery on a consumer-oriented machine, since so few general consumers buy spares, but the battery does look to be easily user-serviceable if you're steaming mad about it. 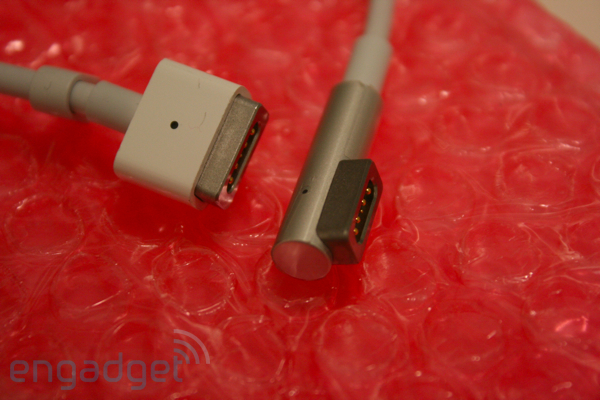 There's also a slightly-redesigned MagSafe connector that's similar to the one from the MacBook Air -- it's a nice improvement that relieves some cable strain, and both MacBook and adapter work just fine with older MagSafe plugs and sockets. And... that's it. 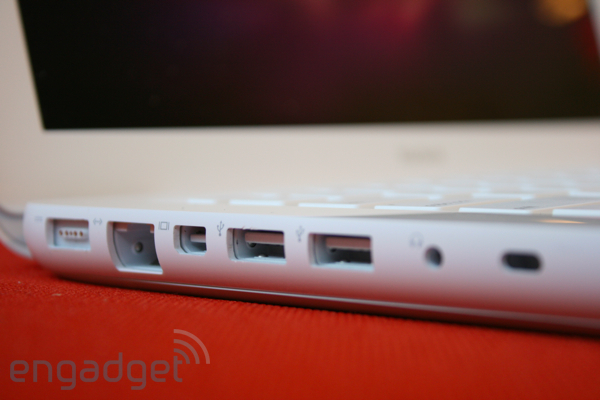 The MacBook is an extremely competent, utterly boring laptop that doesn't have enough ports. If you're desperate for a new Mac and you've only got a grand, it'll do you fine, and the unibody upgrade and nicer screen are certainly welcome -- plastic laptops simply don't come any more solidly built than this. If it were up to us, however, we'd stay home on Saturday nights until we'd stashed enough coin for the $1,199 13-inch MacBook Pro -- not only for the added SD card slot and FireWire port, but also for the brighter, better display and aluminum case that doesn't scratch, dent, and discolor at the slightest provocation. 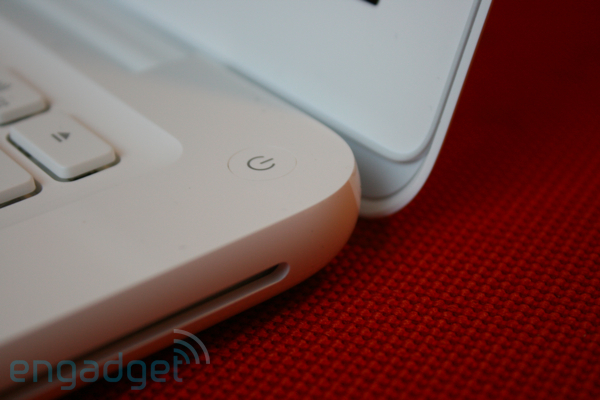 There's just no reason to skimp and get the MacBook if you can manage to get the Pro. That's probably cool with Apple -- they told us that the base Pro was a fine entry-level machine back in June, after all -- but we can't help but feel that this new MacBook represents a wasted pricing opportunity. At $999 it's just too easy to say that you should simply get a Pro, as the added features and aluminum case are absolutely worth an extra $200. But if this machine were, say, $799, it'd be a whole different story, and we'd be far more positive about things -- not to mention the fact that Apple would have an answer for those Laptop Hunters ads. Of course, there's no reason for the company to lower prices when it's already making money hand over fist, but hey -- we can dream, right?